This is a passage from Kohelet – Ecclesiastes of the Old Testament that I like. Shinseikaikan has also marked the passage of time up to today. Shinseikaikan gave its first cry more than 80 years ago in 1934, in Japan at a time when militarism dominated all aspects of society. 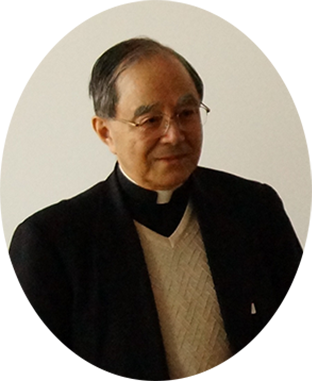 Father Soichi Iwashita, who was convinced of the need to nurture young people based on Christian values, created it under the name of St. Filippo’s Dormitory Foundation. We can safely say that it was a challenge that went against the trend and perspective of Japanese society at that time. The spirit of taking on new challenges has been handed down from generation to generation without interruption until today, marking a wide variety of milestones. During that time, Shinseikaikan faced head on the Japanese society, which was undergoing major upheavals, and steadfastly sustained its role as a base from which views of the world and values based on the Catholic spirit were disseminated, targeting students and adults who hungered for the true light and truth. Thanks to the generous support and cooperation of very many people, Shinseikaikan has recently been refurbished and it will mark its passage into a new era while carrying on the spirit of the founder. Let me close this note by asking for your continued understanding and cooperation and expressing my hope that a great many people will visit us.